Lacrosse isn't the only star article → Find more of them! Lacrosse is a full contact team sport. 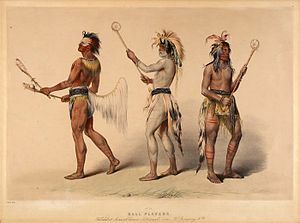 The game was invented and played by Native Americans long before the white man arrived in America. In modern times, the game is played in high schools, colleges, and the armed forces. There are semi-professional and professional teams around the world. The game was being played for centuries by Native Americans before the white man came to American shores. Its name refers to the stick that players carry. The French Jesuit missionary Jean de Brébeuf saw a game in 1637, and was the first to write about it. In the earliest days of the sport, teams may have consisted of as many as 1,000 men. Games were played from dawn to dusk over three days. These games were symbolic warfare and a ceremonial ritual to thank the Great Creator. The game was codified in 1867. By the beginning of the 20th century, schools, college, and universities in Canada and the United States were playing the game. Lacrosse was played in the 1904 and 1908 Olympics by the United States, Canada, and Great Britain. There are 10 men on each team: 3 attackmen, 3 midfielders, 3 defenders, and 1 goalie. Players wear a helmet, shoulder pads, elbow pads, gloves, a cup jock, knee-length shorts, and a numbered jersey. They carry a lacrosse stick that varies in length, depending on a player's position. Offensively, the objective of the game is to score by shooting the ball into an opponent's goal, using the lacrosse stick to catch, carry, and pass the ball to do so. Defensively, the objective is to keep the opposing team from scoring and to gain the ball through the use of stick checking and body contact or positioning. The sport has four major types: men's field lacrosse, women's lacrosse, box lacrosse and intercrosse. The Federation of International Lacrosse runs the World Championships. The European Lacrosse Federation runs the European Lacrosse Championships. This page was last edited on 5 November 2014, at 19:44.